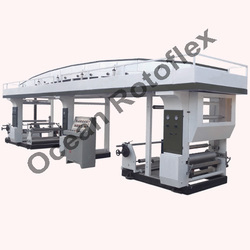 Ocean Rotoflex Manufactures, Exports & Supplies All Types Of Adhesive Tape Coating Machine For Varied Coating Applications From Ahmadabad, Gujarat, India. We Have Been Successfully Manufacturing, Exporting & Supplying All Types Of Coating Machine Since Last 25 Years From Ahmadabad, Gujarat, India. · » Good Quality Electronic Input Drives, Motors, Tension Control System Etc. We Have Been Servicing The Adhesive Tape Industry For Over Twenty Years And Offering A Range Machinery That Is Specially Designed To Manufacture All Kind Of Adhesive Tapes For Various Applications. 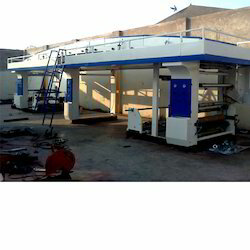 We Have Already Successfully Installed More Than 500 Machines In Various Parts In India & Abroad. Our Range Of Machinery & Technical Expertise Can Serve From Bopp Tapes To Construction Tapes. 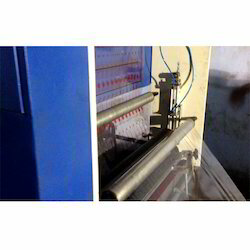 This Laboratory-Type Hot Melt Adhesive Coating And Laminating Machine Is Invented For Laboratory Use. It Cost A Lot Less Raw Materials To Achieve Same Task, Including Sampling / R&D / Testing / Accomplish New Developing Task. This Machine Can Dramatically Reduce The Cost Of Every Time Production. 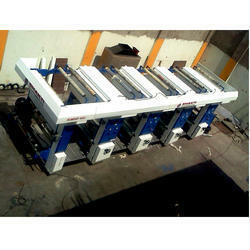 It Is 3 In 1 Function Since It Also Allows Lamination Take Place After Fresh Extrude. With Lamination Function, You Will Be Able To Produce New Combination / Any New Development Effectively. It Can Also Handle Well On Small-Scale Production. Adhesive coating lamination machine works in terms of electrical heat source. The gravure equipped with adhesive coating lamination plant supports for coating adhesives on labeling and packaging film materials. 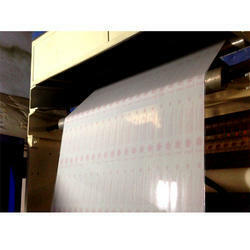 This is a suitable option to produce variety of packaging films with adhesives applied on it. The heating roller with nip roll keeps the application flawless. Adhesive coating lamination line suits best for fast production of packaging bags with lamination lines. Extrusion-based coating/laminating and adhesive-based film laminating are different manufacturing techniques a converter can use to make a composite construction. The physical properties and performance characteristics of flexible packaging made by extrusion coating and laminating can be identical to that made by film laminating. Many of the major components of the final constructions are also the same. So which technique should be used for a particular product package? The decision is not an easy one, with equipment availability, run length, polymer specifications, and manufacturing efficiencies some of the major variables in this equation. 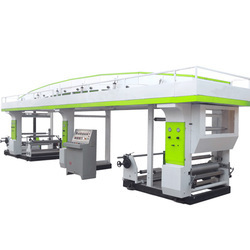 The information of adhesive lamination machine / adhesive coating machine is provided for the purpose of guideline & indication only and doesn't form any kind of commitments. Coating Lamination Machine is consumer demand for package features such as easy open packages, barrier properties, safety, tamper resistance, product efficacy, cost and manufacturing efficiencies which will directly determine which process will serve these interests. Fortunately, advances in resin technology, new chemistry options for coatings, and improvements in surface modification and sealing methods will enable new, high performance structures to better meet these challenges. The manufacture of film laminates is a continuous process of coating and bonding, with process differentiation defined by the type of adhesive used and how the adhesive is applied and converted. These processes are classified as either wet or dry laminating processes and are described. To meet diverse requirements of our clients in the best possible manner, we are manufacturing, exporting & supplying a comprehensive assortment of Coating Machines - BOPP Adhesive Coating Machine. Offered machines are manufactured by our skilled professionals using the best technology to render maximum clients' satisfaction. In order to meet variegated demands of clients, this is made available in various customized options. Besides, clients can avail this product at market-leading prices. 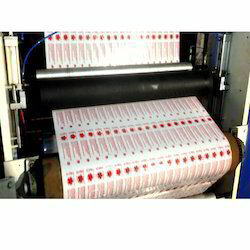 Plastic Tape Lamination Coating Machine is consumer demand for package features such as easy open packages, barrier properties, safety, tamper resistance, product efficacy, cost and manufacturing efficiencies which will directly determine which process will serve these interests. Fortunately, advances in resin technology, new chemistry options for coatings, and improvements in surface modification and sealing methods will enable new, high performance structures to better meet these challenges. The manufacture of film laminates is a continuous process of coating and bonding, with process differentiation defined by the type of adhesive used and how the adhesive is applied and converted. These processes are classified as either wet or dry laminating processes and are described . To meet diverse requirements of our clients in the best possible manner, we are manufacturing, exporting & supplying a comprehensive assortment of Coating Machines - BOPP Adhesive Coating Machine. Offered machines are manufactured by our skilled professionals using the best technology to render maximum clients' satisfaction. In order to meet variegated demands of clients, this is made available in various customized options. Besides, clients can avail this product at market-leading prices. Adhesive Lamination/ Coating Plant is consumer demand for package features such as easy open packages, barrier properties, safety, tamper resistance, product efficacy, cost and manufacturing efficiencies which will directly determine which process will serve these interests. Fortunately, advances in resin technology, new chemistry options for coatings, and improvements in surface modification and sealing methods will enable new, high performance structures to better meet these challenges. The manufacture of film laminates is a continuous process of coating and bonding, with process differentiation defined by the type of adhesive used and how the adhesive is applied and converted. These processes are classified as either wet or dry laminating processes and are described. To meet diverse requirements of our clients in the best possible manner, we are manufacturing, exporting & supplying a comprehensive assortment of Coating Machines - BOPP Adhesive Coating Machine. Offered machines are manufactured by our skilled professionals using the best technology to render maximum clients' satisfaction. In order to meet variegated demands of clients, this is made available in various customized options. Besides, clients can avail this product at market-leading prices. 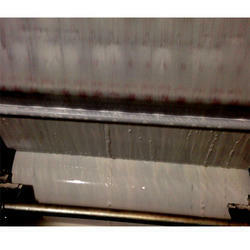 comparison between lamination and coating processes. Adhesive Lamination Coating Plant is consumer demand for package features such as easy open packages, barrier properties, safety, tamper resistance, product efficacy, cost and manufacturing efficiencies which willdirectly determine which process will serve these interests. To meet diverse requirements of our clients in the best possible manner, we are manufacturing, exporting & supplying a comprehensive assortment of Coating Machines - BOPP Adhesive Coating Machine. Offered machines are manufactured by our skilled professionals using the best technology to render maximum clients' satisfaction. In order to meet variegated demands of clients, this is made available in various customized options. Besides, clients can avail this product at market-leading prices. Adhesive Lamination Unit Manufacturer In Gujarat Adhesive laminates can be made by dry bonding, wet bonding, UV/EB curing and by hot melt adhesion processes. Extrusion laminates are constructed by extruding a thin tie-layer of a plastic material to bond together two dissimilar materials, such as a polymer film, paper or foil. Furthermore, coextruded materials are produced by extruding several polymer layers simultaneously and then pressing/cooling them together. Incompatible layers are laminated together using a thermoplastic adhesive as a tie layer. Eight layers or greater can be produced to optimize barrier, material thickness, weight and cost performance parameters. Surface modification techniques can also be employed to for low polarity polymeric films and other based substrates to improve structural performance. These methods can include the application of roll coatings (polymers, lacquers, primers), coextrusion, immersion, and plasma treatments. Solvent and water-based barrier coatings are common, as are dry coatings such as varnishes cured by heat or oxidation. Chemical surface treatments, vacuum plasma depositions, and specifically vapor-deposited oxides and nitrides are also employed to improve packaging performance. To meet diverse requirements of our clients in the best possible manner, we are manufacturing, exporting & supplying a comprehensive assortment of Coating Machines - BOPP Adhesive Coating Machine. Offered machines are manufactured by our skilled professionals using the best technology to render maximum clients' satisfaction. In order to meet variegated demands of clients, this is made available in various customized options. Besides, clients can avail this product at market-leading prices. BOPP Tape Adhesive Lamination Coating Plant works in terms of electrical heat source. The gravure equipped with BOPP Tape Adhesive Lamination Coating Plant supports for coating adhesives on labeling and packaging film materials. This is a suitable option to produce variety of packaging films with adhesives applied on it. The heating roller with nip roll keeps the application flawless. 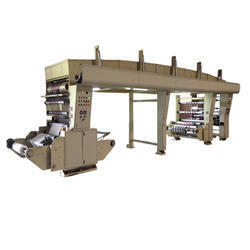 Adhesive coating lamination line suits best for fast production of packaging bags with lamination lines. Coating Lamination Line works in terms of electrical heat source. The gravure equipped with adhesive coating lamination plant supports for coating adhesives on labeling and packaging film materials. This is a suitable option to produce variety of packaging films with adhesives applied on it. The heating roller with nip roll keeps the application flawless. Adhesive coating lamination line suits best for fast production of packaging bags with lamination lines. To meet diverse requirements of our clients in the best possible manner, we are manufacturing, exporting & supplying a comprehensive assortment of Coating Machines - BOPP Adhesive Coating Machine. Offered machines are manufactured by our skilled professionals using the best technology to render maximum clients' satisfaction. In order to meet variegated demands of clients, this is made available in various customized options. Besides, clients can avail this product at market-leading prices. Lamination Coating Machine Adhesive Plant Adhesive laminates can be made by dry bonding, wet bonding, UV/EB curing and by hot melt adhesion processes. Extrusion laminates are constructed by extruding a thin tie-layer of a plastic material to bond together two dissimilar materials, such as a polymer film, paper or foil. Furthermore, coextruded materials are produced by extruding several polymer layers simultaneously and then pressing/cooling them together. Incompatible layers are laminated together using a thermoplastic adhesive as a tie layer. Eight layers or greater can be produced to optimize barrier, material thickness, weight and cost performance parameters. Surface modification techniques can also be employed to for low polarity polymeric films and other based substrates to improve structural performance. These methods can include the application of roll coatings (polymers, lacquers, primers), coextrusion, immersion, and plasma treatments. Solvent and water-based barrier coatings are common, as are dry coatings such as varnishes cured by heat or oxidation. Chemical surface treatments, vacuum plasma depositions, and specifically vapor-deposited oxides and nitrides are also employed to improve packaging performance. Lamination Coating Machine Adhesive plant works in terms of electrical heat source. The gravure equipped with adhesive coating lamination plant supports for coating adhesives on labeling and packaging film materials. This is a suitable option to produce variety of packaging films with adhesives applied on it. The heating roller with nip roll keeps the application flawless. Adhesive coating lamination line suits best for fast production of packaging bags with lamination lines. 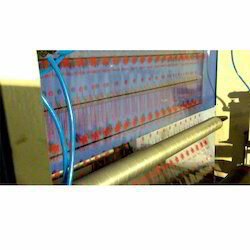 Adhesive coating lamination machine works in terms of electrical heat source. The gravure equipped with adhesive coating lamination plantsupports for coating adhesives on labeling and packaging film materials. This is a suitable option to produce variety of packaging films with adhesives applied on it. The heating roller with nip roll keeps the application flawless. Adhesive coating lamination line suits best for fast production of packaging bags with lamination lines. 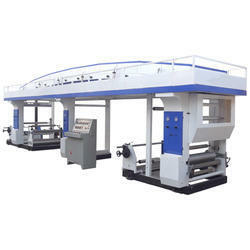 Self Adhesive Lamination Machine works in terms of electrical heat source. The gravure equipped with adhesive coating lamination plant supports for coating adhesives on labeling and packaging film materials. This is a suitable option to produce variety of packaging films with adhesives applied on it. The heating roller with nip roll keeps the application flawless. Adhesive coating lamination line suits best for fast production of packaging bags with lamination lines. Tape Coating Lamination Adhesive Unit Plant works in terms of electrical heat source. The gravure equipped with adhesive coating lamination plantsupports for coating adhesives on labeling and packaging film materials. This is a suitable option to produce variety of packaging films with adhesives applied on it. The heating roller with nip roll keeps the application flawless. Adhesive coating lamination line suits best for fast production of packaging bags with lamination lines. handles on a form, fill and seal machine (FFS). components permits a converter to run an adhesive lamination structure on an extrusion coating line as well as the reverse. upgrading the equipment at a later time. substrate and compare it to the extrudate. To maintain properties, eliminating ½ mil of substrate may not translate directly into adding ½ mil of substrate.